Domain Name System (DNS) is similar to an address book. It is a system that converts names to numbered addresses. To make life a little easier for people, websites generally use easy to remember names, such as www.google.com but this is not the real address of the website. The real address is a number or IP address. The ip address for google is 172.217.22.78. So when you enter www.google.com in your browser, the computer first goes off and looks up the IP address from a DNS server. After it has the ip address it contacts the website (or more specifically, the server hosting the website). The above is a very simple overview and the actual DNS system is a little more complex. If you want to know more a good place to start is with The Internet Domain Name System Explained for Non-Experts by Daniel Karrenberg of the Internet Society. DNS is fine for normal websites but not particularly friendly for small devices with limited resources. Luckily we have mDNS or multicast DNS. mDNS stands for multicast DNS. This is a system that allows devices such as the ESP8266 to utilize a DNS style system (urls) rather than numeric ip addresses. mDNS does a similar thing to regular DNS but in a different way. mDNS uses urls with a .local suffix, such as esp8266.local or http://esp8266.local. When you enter a .local address in to a browser it sends out a signal (a multicast hence the name) to all the devices connected to the local network asking the device with this address to identify itself. The device does this by sending back its actual ip address. The browser then knows the ip address to use. Thanks to a nice library, mDNS is very easy to use on the ESP8266. All you need to do is include the library and initialise it. Then a little later, usually in the setup() function initialise the library. Any name can be used. Using “esp8266″ means the url will be esp8266.local. MDNS.begin() returns TRUE or FALSE depending if the initialising was successful or not. This means we can check and issue an error message if the initialisation fails. You should be able to see that this is the same sketch as the last example except for the new mDNS lines. 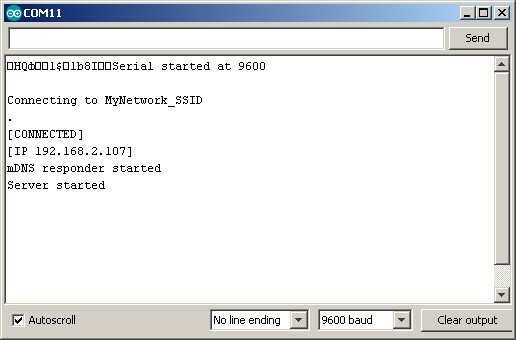 Upload the sketch and open the serial monitor. The ESP8266 should connect to your wifi and display the ip address in the serial monitor as before. Using a PC or an IOS device (not an Android device) open a browser and go to the ip address (in my case it is 192.168.2.107). You should have the same webpage as before. Now try using the mDNS service. Open a new tab or page in the browser and go to esp8266.local. Hopefully you should see the same webpage. Unfortunately mDNS does not work on Android. It is there but not implemented in any of the web browsers. To get around this we can use one of the wifiManager libraries. This is covered in the next part. Hi Martyn, Very good tutorial so far. However, esp8266.local is not working on Safari or Chrome on MAC, iOS and Windows 7.